This resource is an incredibly valuable peek into our classroom. Class DoJo is also a HUGE communication tool for us, but much like quick texts. The "class stories" section will provide PICTURE messages about class activities, future class activities, student of the week information, any important school news, classroom needs, field trips or special events, etc. Signing up for Class DoJo also helps you keep track of your child's behavior and responsibilities. All of my short messages or reminders will be communicated through "messages" in Class DoJo. Mrs. Cunningham and I will be coordinating a newsletter once a week detailing things like curriculum, important dates, reminders, etc. for your benefit. This will come in the form of a link using google docs, every Monday, through email. Schoology is a learning management system (LMS) for K-12 schools, higher education institutions, and corporations that allows users to create, manage, and share content and resources. Also known as a course management system (CMS) or virtual learning environment (VLE), the cloud-based platform provides tools to manage any classroom or blended learning environment. Schoology includes attendance records, online grade book, tests and quizzes, and homework drop boxes. The social media interface facilitates collaboration among a class, a group, or a school. Dundee Schools has chosen this tool for our district to learn and utilize beginning this 2018-2019 school year, starting in January. We're all starting by using it as a tool to communicate. This tool will hopefully consolidate ALL Dundee's tools and resources into ONE house. I'm excited to see the possibilities! Third graders will be kind to other students and staff by using good manners and positive words. Third graders will be safe by keeping appropriate control of their hands, feet, and objects. Third graders will show respect by displaying a positive attitude, putting forth their best effort, and work cooperatively with other students and staff. I have one rule of my own in our classroom, and that is to RESPECT me, RESPECT other students, and most of all----RESPECT yourself. Where this rule may seem too simple, respect entails everything from keeping your hands to yourself to honesty and integrity. 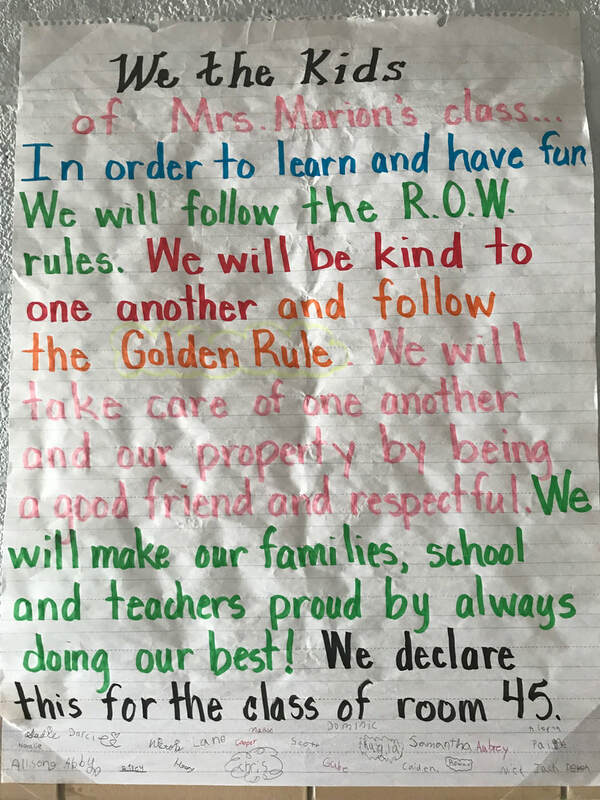 I plan to not only teach and model my classroom rule, but to follow through with a structured set of consequences if being respectful doesn't happen. Because every situation and student is different, each will be handled individually. Please refer to the Elementary Handbook button above for any other discipline concerns. ﻿﻿ Third grade continues to utilize eschool to communicate grades, even before report cards are finalized approximately every 9 weeks. These grades will be updated about every 2-3 weeks, so help yourself! If you haven't already utilized this tool, a "how-to" will and can be sent to you soon, or in the future for any reason. Once you are connected, you will be for your entire journey here at DES. Playing an ACTIVE role in your child's classroom doings will logically increase their academic success and progress! So, how can you be active? Talk to your child daily about their learning, social interactions, and goals. If you get the ever-popular "nothing" answer when asking about their day, please know that our website will have a detailed account of our days, at your dispense. It is my choice to have your children use one DURABLE PLASTIC folder to carry any work, mail, or special notes to and from school. This will be taken home every night, and I will expect it to return the following day. I will have baskets , pockets, or trays where the kiddos can responsibly turn things in as well. This is a great way to keep the students organized and responsible. Also, unless there is time-sensitive information, know that every Monday your child will bring home their graded work and school news from the previous week. Hopefully this won’t be an issue this year, but if your child is absent or tardy, the office must have a note or call from you. School begins promptly at 7:50! Also, if there are any changes in the regular transportation arrangements, please call the office (ext. 2400) or send a note. If there ever is an extended illness or vacation, please know that asking for work does not replace the classroom experience, therefore, I’ll do my best as long as you too are understanding and flexible. Schoolwork on vacation will most likely involve duties such as collecting/reading/ presenting travel brochures, calculating food costs using receipts, taking pictures of different habitats, or writing a daily journal. In an effort to integrate note taking, presentation skills, letter writing, and a little group bonding, we participate in a student of the week routine. You will be notified by letter when your child is the "Student of the Week." The letter gives suggestions of how your child can present themselves, and will get special perks throughout the week. The more you make out of it, the more memorable it is for your child. K-3 has a no homework policy. If you have any questions or concerns, please contact the administration. On the other hand, reading is required to supplement our reading program. Your child should ALWAYS have a good-fit book within their reading level for them to read almost every night of the week for 20 minutes. Third grade is where students focus on mastering comprehension of text rather than just reading the words, so any involvement you may contribute is greatly appreciated! Birthday treats are welcomed and honored, but not required. Where I often have napkins, plates, and utensils, it would be great if you included any necessary "extras" that your birthday treat may require. Every 3rd Friday, of each month, will be devoted to honoring that month's student birthdays. Please keep in mind that there will be MANY birthdays to celebrate in that day, and I welcome creative treat choices. For special events and parties, I utilize Signup Genius to ask for donations. This will come to you via email, and sometimes classroom DoJo. This gives you the opportunity to help our class. Please place any important forms or money in a ﻿clearly marked envelope﻿ to where, and to whom, it should go before sending it in your kiddo's folder! Thanks so much!